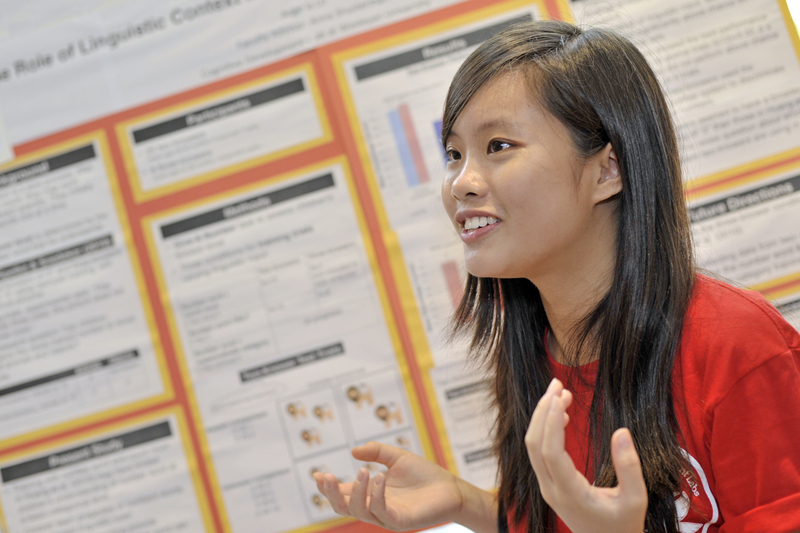 Psychology major Yan Pui “Angela” Lo ’14 presented “The Role of Linguistic Context in Children’s Acquisition of Number Words.” Her advisor is Anna Shusterman, assistant professor of psychology. Chemistry major Sarah Hensiek ’13 discussed her research on “Comparative Studies of Transition Metal Complexes of Polyacetate Tetraaza Macrocycles.” Her advisor is T. David Westmoreland, associate professor of chemistry. Raymond Wong ’14 spoke about his summer-long research on “Are Wealthier States More Successful than Poorer States? : The Impact of Income Packaging on States’ Child Poverty Rates. 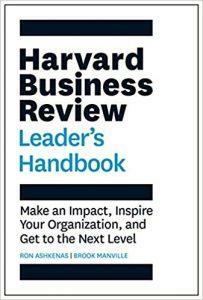 Wong’s advisor was Wendy Rayack, associate professor of economics, tutor in the College of Social Studies. Wong completed his research through the Quantitative Analysis Center. Ellen Lesser ’15 presented a poster titled “Estimation Bias in Numerical and Non-Numerical Spatial Tasks in 9- and 10- Year Olds and Adults.” Her advisors are Hilary Barth, associate professor of psychology, associate professor of neuroscience and behavior, and postdoctoral fellow Emily Slusser. 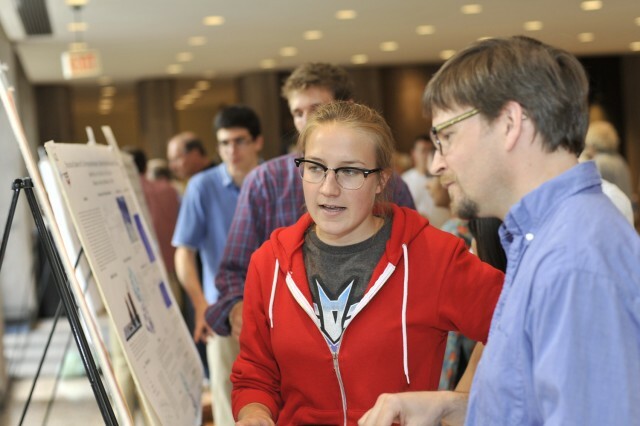 Molecular biology and biochemistry and chemistry major Laura Nocka ’13 speaks to Francis Starr, associate professor of physics, about her research on “Structure and Function of Holliday Junctions Complexed with Ions and HU Protein. 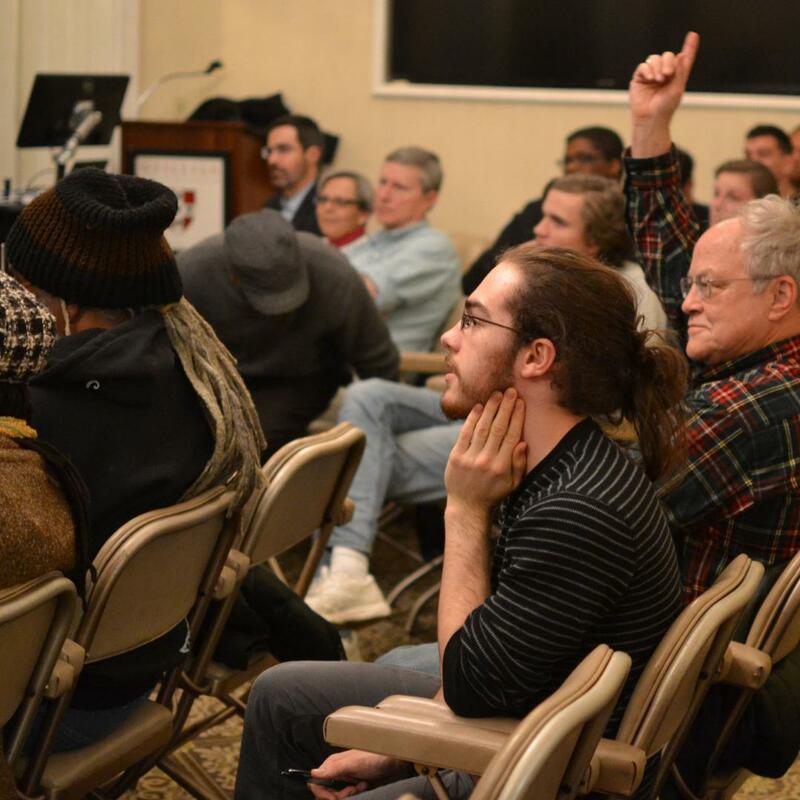 Her advisors are Ishita Mukerji, dean of the Natural Sciences and Mathematics, professor of molecular biology and biochemistry, and David Beveridge, the Joshua Boger University Professor of the Sciences and Mathematics, professor of chemistry. David Shor ’13 presented “Impact of Exposure to Party Mentions in Political Ads and Local News on Ability to Identify Candidates’ Political Party.” His advisor is Erika Franklin Fowler, assistant professor of government. 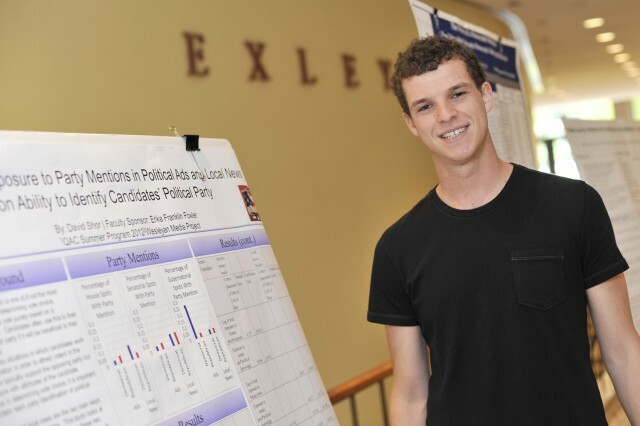 Shor completed his research through the Quantitative Analysis Center and Wesleyan Media Project. Earth and environmental science major Ariela Knight ’13 presented “Sediment Geochemistry and Laminations of Ballston Lake, N.Y.” Her advisor is Tim Ku, associate professor of earth and environmental sciences. 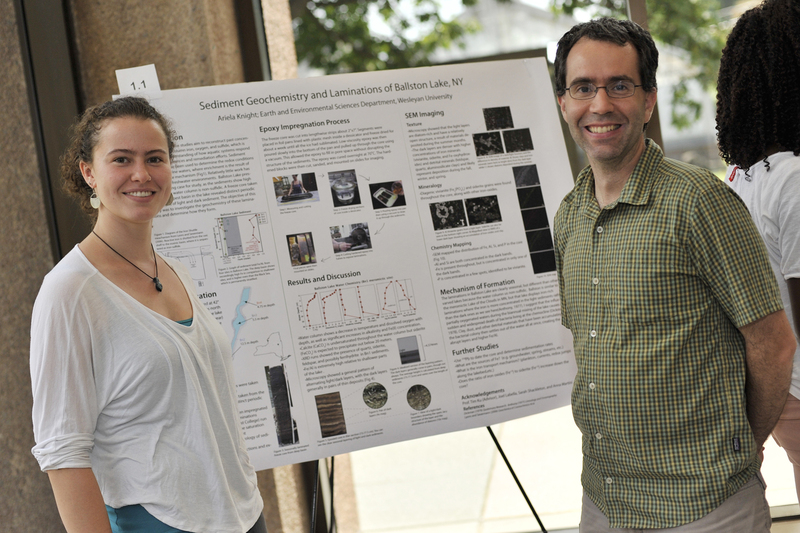 Pictured at right is Dana Royer, associate professor of earth and environmental sciences. More than 80 undergraduates presented recent research at the Wesleyan Summer Research Poster Session July 29 in Exley Science Center. 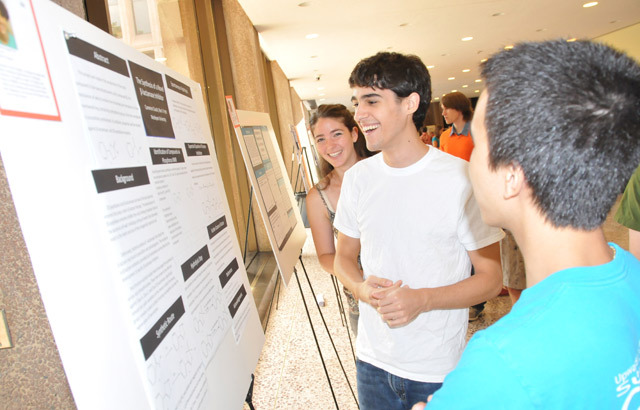 Students majoring in biology, molecular biology and biochemistry, psychology, physics, earth and environmental sciences, chemistry, and other disciplines spent at least 10 weeks this summer working on research projects. 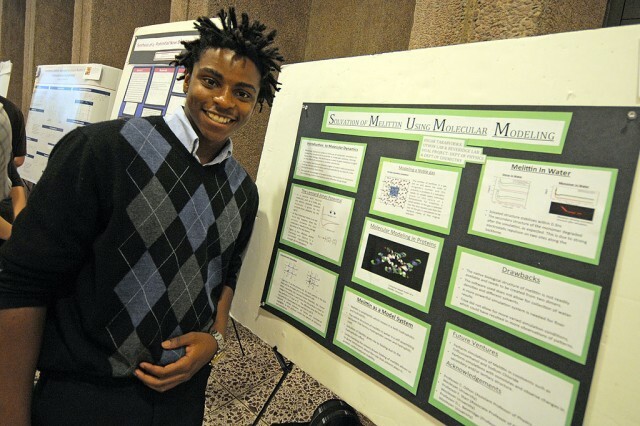 Oscar Takabvirwa '14 presented his research on "Solvation of (the peptide) Melittin Using Molecular Modeling." 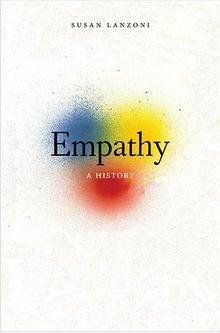 His advisors are Christina Othon, assistant professor of physics, and David Beveridge, the Joshua Boger University Professor of the Sciences and Mathematics, professor of chemistry. This was a dual project between the Department of Physics and Department of Chemistry. 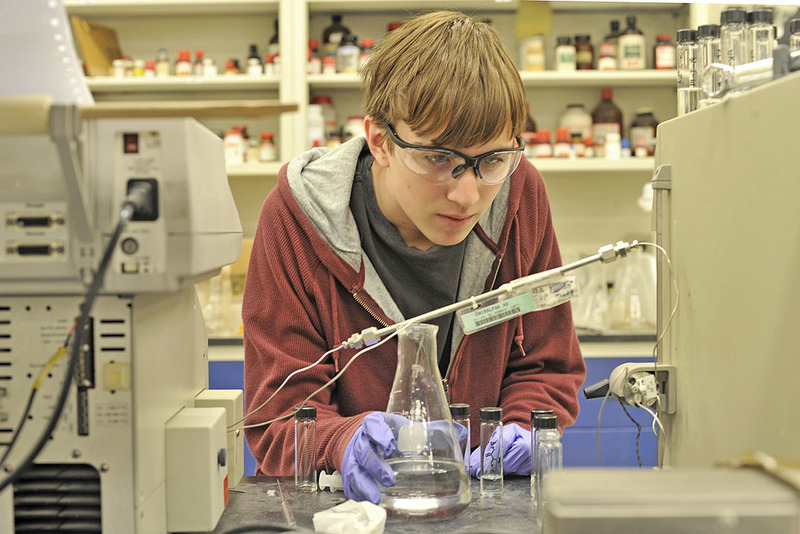 Hughes Fellow Patrick Sarver '14 is spending his summer working with Michael Calter, associate professor of chemistry. 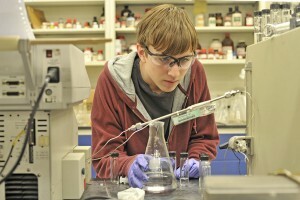 He studies “The Catalytic, Asymmetric ‘Interrupted’ Feist-Benary Reaction." 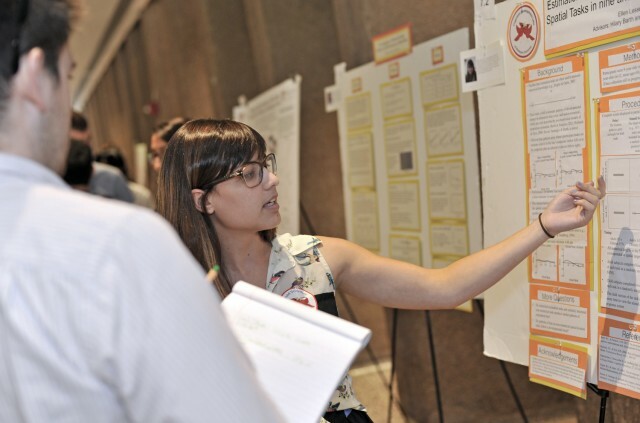 Hughes Summer Research Program culminates with a poster session in which Hughes Fellows and other summer research undergraduates present their research. 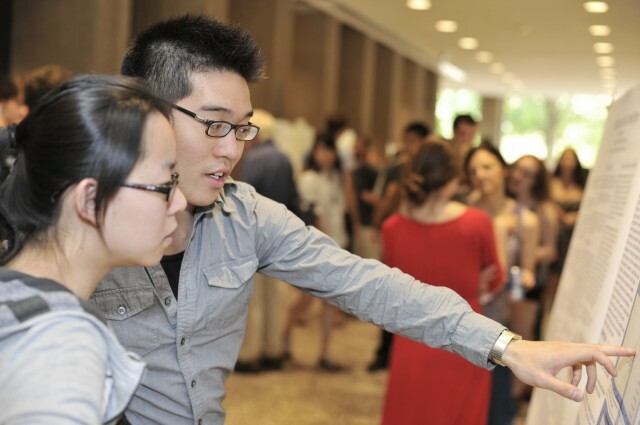 The 2011 poster session is free and open to the public. 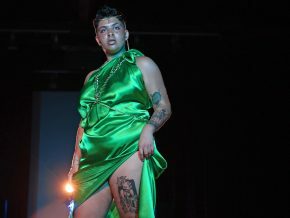 It will take place between 1 and 3 p.m., Friday, July 29 in the lobby of Exley Science Center. 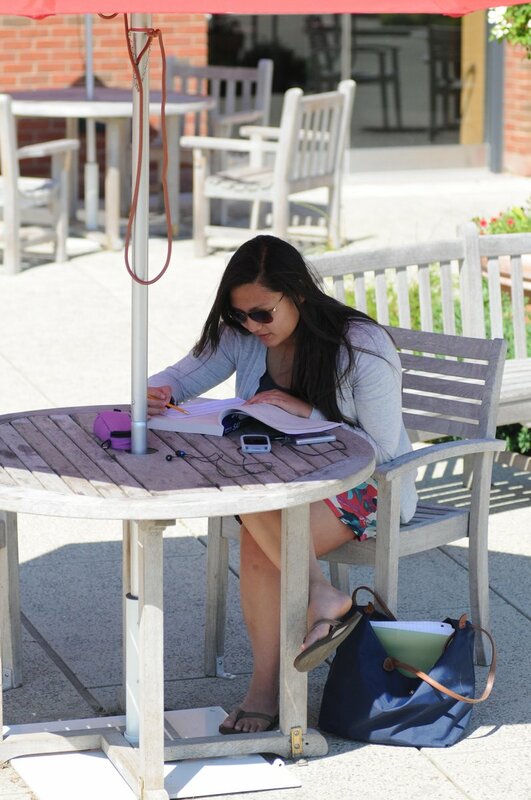 This summer, Wesleyan is hosting 43 Hughes Fellows and approximately 65 Hughes Associates. 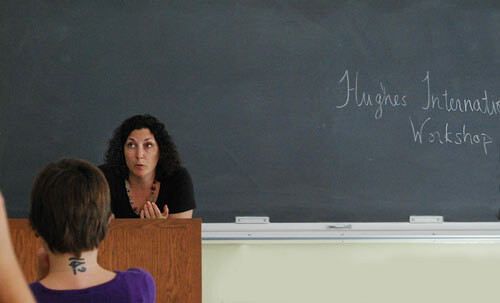 Hughes Associates are not funded by Hughes, but they participate in Hughes activities. 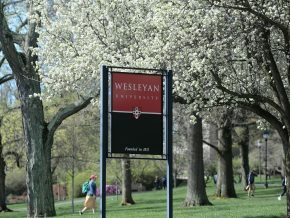 Wesleyan faculty members serve as mentors in the summer program. For more information on the 2011 summer fellows, click here. 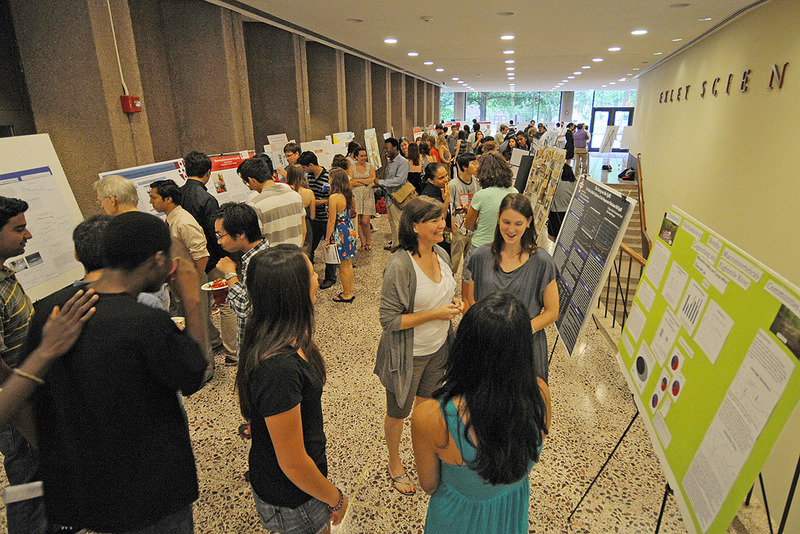 Wesleyan presented its annual Summer Research Poster Session July 30 in Exley Science Center. More than 100 students, mostly from Wesleyan, participated. 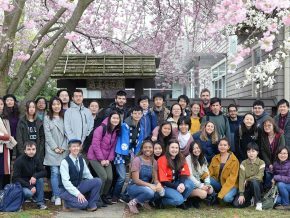 Students are funded from Hughes, the Mellon Foundation, a Rauch Environmental Grant, the Wesleyan McNair Program, Sonnenblick and the Robert Schumann Endowment. 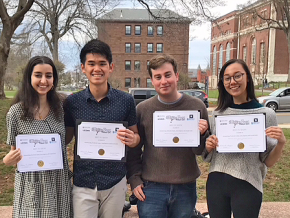 Students from the Quantitative Analysis Center also participated. 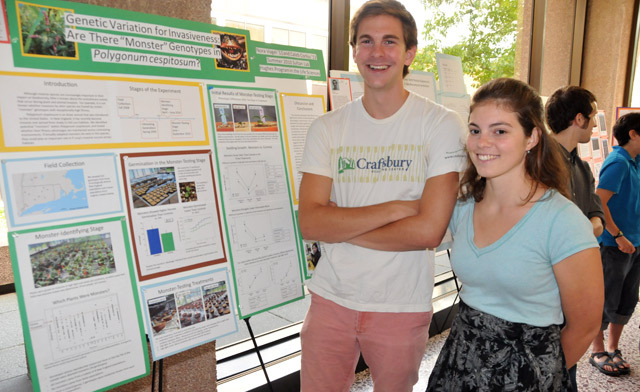 Biology majors Nora Vogel ’11 and Caleb Corliss ’13 discussed their poster titled “Genetic Variation for Invasiveness: Are there Monster Genotypes in Polygonum cespitosum?” They’ve spent the summer trying to understand what role “monster” genotypes (genotypes with the highest relative fitness) play in the invasive spread of this species. Their advisor is Sonia Sultan, chair of the Biology Department, professor of biology, professor of environmental studies. 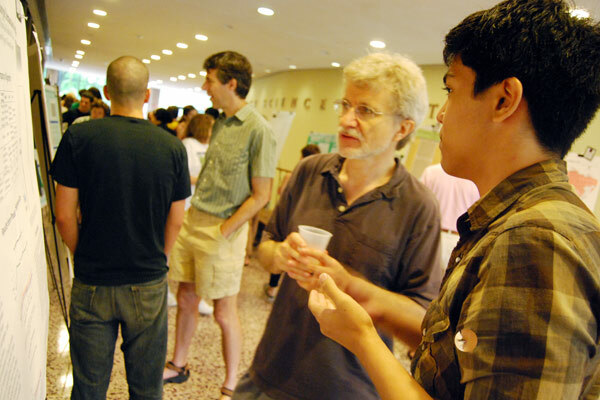 Hughes Fellow Juan Carlo Francisco '11 speaks to Michael Weir, director of the Hughes Program in the Life Sciences, professor of biology, about his project "Comparative Analysis of Ecotype Demarcation Algorithms" during the 2009 Summer Undergraduate Research Poster Presentations July 31 in Exley Science Center. 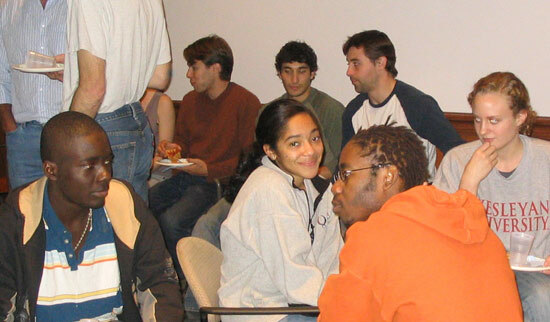 Francisco's advisors were Danny Krizanc, professor of computer science, and Fred Cohan, professor of biology. 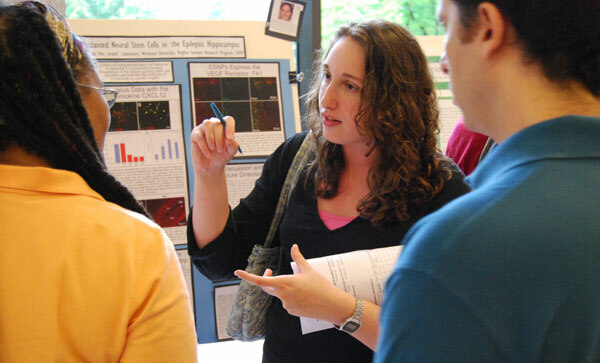 Hughes Fellow Danielle Mor ’10 speaks about her research titled “Identifying Migration Guidance Factors for Transplanted Neural Stem Cells in the Epileptic Hippocampus." 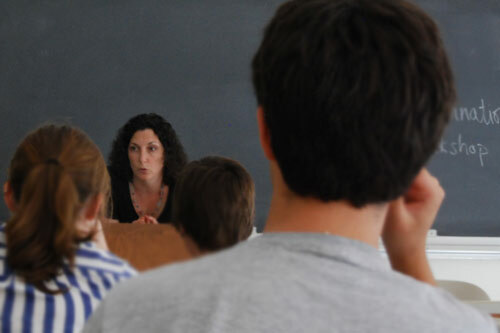 Mor’s advisor is Laura Grabel, the Lauren B. Dachs Professor of Science and Society, professor of biology. 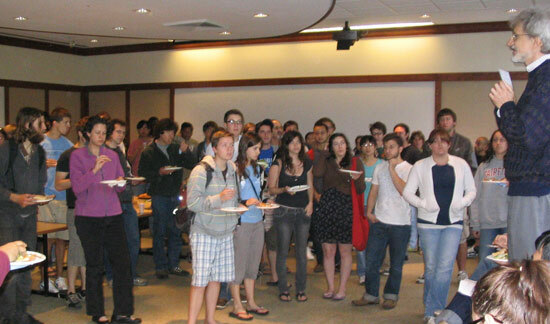 The Molecular Biology and Biochemistry Department hosted an Ice Cream Social July 27 near Woodhead Lounge. 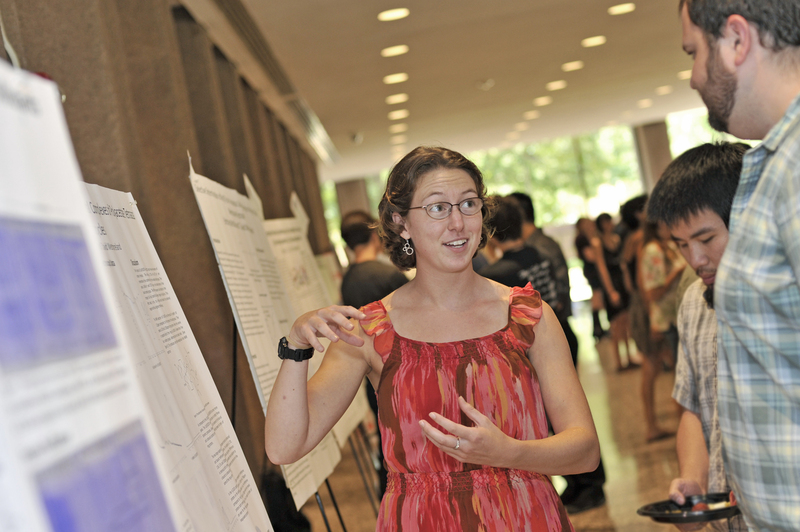 The department welcomed all students in the sciences and the Hughes Fellows. 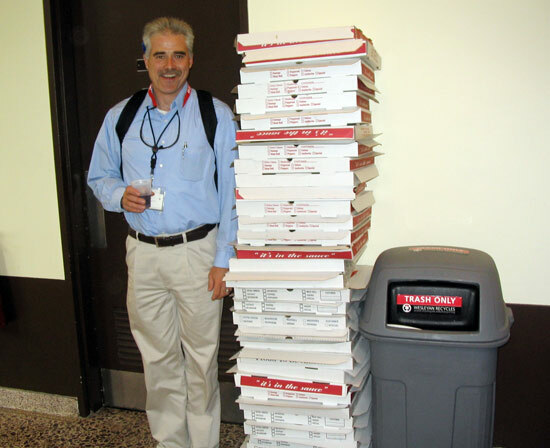 Michael Weir, director of the Hughes Program in the Life Sciences, professor of biology, speaks to students at a pizza party that launched the the 21st Hughes Summer Research Program May 27. 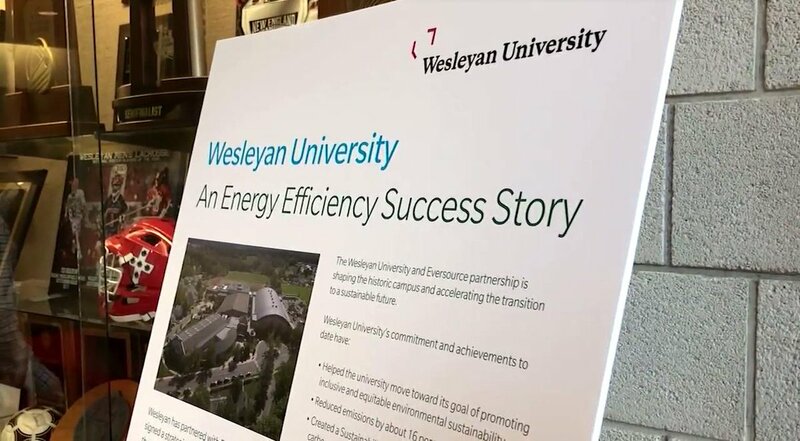 Weir and Laurel Appel, director of the McNair Program, explained various seminars and workshops available to complement the students' summer-long research efforts. 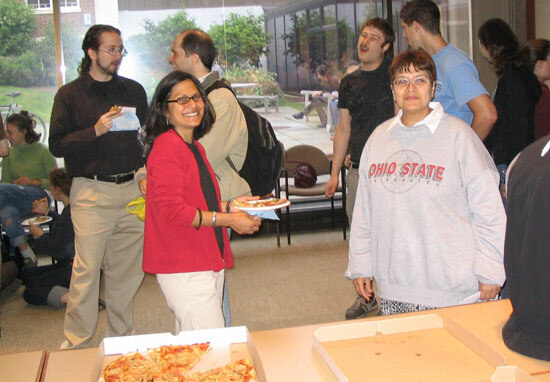 The gathering allowed the students to meet and mingle with several faculty members including, at left, Ishita Mukerji, professor of molecular biology and biochemistry, and Manju Hingorani, associate professor of molecular biology and biochemistry. Pizza party attendees included 58 Hughes Fellows, eight McNair Fellows, nine Mellon Fellows, six SCIC Fellows, 11 students supported by other funds, and volunteers who started their 10 week summer research projects.